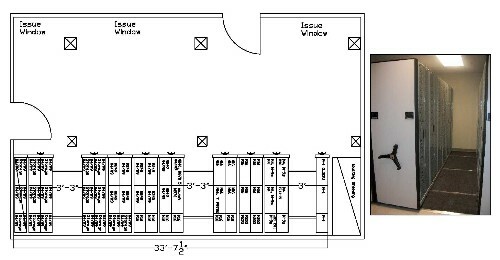 Combat Weapon Storage Systems provides site surveys to measure your armory space and meet with armorers and resource advisors to give full blown proposals. Measuring your arms room can be critical to making sure all of your weapons and associated gear fit in a designated arms room space. Whether the final solution calls for fixed weapon racks or a mobile carriage system, sizing your space will ensure a proper fit. Our sales team has provided site surveys on multiple continents and almost every state, providing invaluable input into armory design and implementations. Sample layouts below featuring Fixed & Mobile Weapon Rack Systems. 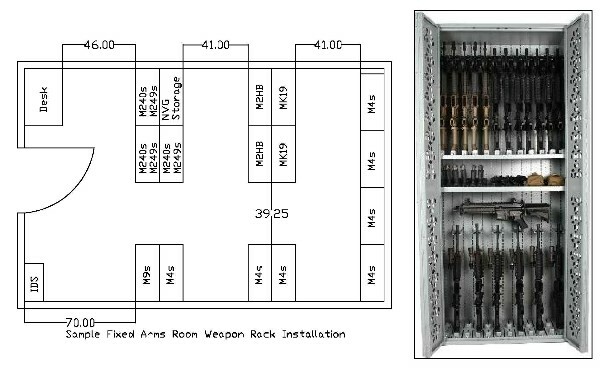 Combat Weapon Storage Systems provides global installation efforts. Vital Valt. 2005-2016 © All rights reserved.